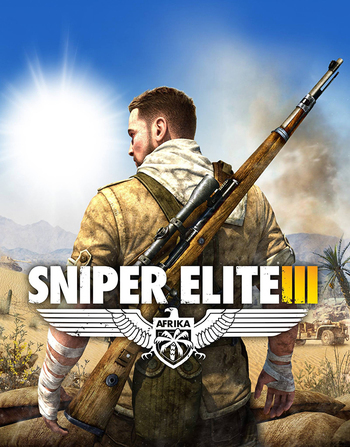 The third game in the Sniper Elite series, a prequel set during the campaigns in Africa, chronologically before the fall of the Nazis in Sniper Elite V2. You are again Karl Fairburne, an SOE officer who is sent in to deal with Nazi Wunderwaffe or Wonder Weapons. The location is various parts of Africa as Karl does his best to help turn the tide against the Nazis in favour of the Allies. The game is aimed at being more like the original Sniper Elite, with the more open environments allowing the player to approach their targets with more flexibility as well as possibly putting them in assorted and potentially hazardous situations. The player may also find new solutions to each objective as they stalk around the enemy territory. The core sniping mechanic is still effectively unchanged in this game but other changes were made or added to the other aspects of the game. A more detailed kill cam incorporating a new muscle and circulatory system layers, dynamic bone fractures, and a detailed vehicle kill cam add new levels of spectacle to the game. A new variety of tricks that the player can use to distract the enemy or hide their presence are made available to the player. These tricks include starting small fires and sabotaging enemy equipment so that it produces more noise to mask the player's shots. The classic rock throwing distraction is still available. A brand new feature added to this game is the relocation mechanic. After the player fires a shot they need to relocate or risk being found. The enemy immediately reacts to sniper fire now and heads for cover and then begin searching for the player. Repeated shots from the same location will help the enemy locate the player and they will then try to flush the player out or corner and kill them. If the player relocates successfully the enemy will eventually give up on the search allowing the player to once again more freely stalk the enemy. Other changes to features include how the enemy infantry and vehicles react and pursue the player. The enemies now more intelligently use cover, suppressing fire, and the general environment against the player. Vehicles are no longer static and will actively hunt the player. The vehicles have expanded weak spot mechanics but are now more difficult to take out. The player has to use a variety of tactics including mines, explosives, anti-tank weapons, or carefully placed shots at certain parts of the tank. A new Experience Point system mechanic has been introduced that allows the player to customize their gear. The experience points can be earned in both single player and multi-player and carry over between the modes. Received a sequel : Sniper Elite 4, set not too long after in Italia. Target Hitler: Hunt the Grey Wolf: A mission that involves hunting either Hitler or what may possibly be his body double. It is never verified in the mission which it is for certain. This was a Pre-Order bonus, but like the "Kill Hitler" pre-order mission for V2, it was later released as DLC. Save Churchill: A three-part DLC which is Exactly What It Says on the Tin - a mission to save Winston Churchill. Hunter Weapons Pack: It includes the Soviet SVT rifle, the M1897 trench gun, and the M1917 revolver. Eastern Front Weapons Pack: Adds the Mosin-Nagant rifle, the Blyskawica SMG, and the Tokarev TT-33 pistol. Axis Weapons Pack: Adds the Japanese Arisaka Type 99 rifle, the Italian Beretta Model 38 SMG, and the German Walther P38 pistol. Patriot Weapons Pack: Adds the Springfield M1903 rifle, M3 Grease Gun SMG, and M1911A1 pistol. Sniper Rifles Pack: Adds the Kar98k, tuned Springfield, and M1917 Enfield sniper rifles. Camouflage Weapons Pack: Adds a cloth-wrapped Mosin-Nagant rifle, camo-pattern StG 44, and silenced Hi-Standard HDM pistol. U.S. Camouflage Rifles Pack: Adds camouflaged versions of the default M1 Garand, the Springfield, and the M1917 Enfield rifles. International Camouflage Rifles Pack: Adds camouflaged versions of the Lee-Enfield, Kar98k, and SVT-40 rifles. Allied Reinforcements Outfit Pack: Allows the player to use an "Allied Sniper", "Indian Army Marksman", or "GI Sniper" model in competitive multiplayer modes. Accidental Aiming Skills: Due to the identical shooting mechanics to the previous games this remains very similar. Players' shots may go wide with unexpected outcomes including killing a different enemy or striking an explosive item setting it off. Anachronism Stew: Quite a number of weapons and vehicles appear too early for certain portions of the North African campaign. The Gewehr 43 used by both German snipers and the player wasn't deployed until 1943, a full year after the timeframe of the game's early missions. The M1D Garand used by Karl Fairburne wasn't developed until after World War II, and even the earlier M1C didn't enter service until 1944. The Panzerschreck didn't enter service until around early-mid 1943, making its appearance in early missions anachhronistic. The M3 Grease Gun and MP44 usable through Downloadable Content weren't in common use until 1944. The Sten Mk. II and M1 Thompson didn't enter production and service until late 1942, so for the first two or so missions their appearances are anachronistic. Tiger I tanks are shown assaulting Tobruk in June 1942, when in reality the first unit equipped with Tigers to reach North Africa didn't arrive until November 1942. Just like the previous game you get to follow the bullet as it smashes into your enemies and destroys internal organs and bones. Only this time there is increased level of detail such as new muscle and circulatory system layers and inclusion of dynamic bone destruction from bullet impact. A new addition is a kill cam view for vehicles which includes the same level of detail as the shots on the enemy infantry. Bad Boss: Vahlen is known for having a Hair-Trigger Temper, and summarily executes several of his men in brutal fashion, sometimes for simply complaining about the bad working conditions in the facilities they're in. Benevolent Architecture: Assorted bits of natural rock, conveniently placed enemy supplies, and sometimes overly convenient landscape features provide players with an advantage. Big Bad: General Franz Vahlen is a high-ranking officer in the Afrika Korps, and the brains behind Project Seuche, a top-secret project for the German Army intent on helping to win the war in the Axis favor. Bloodier and Gorier: Additional details were added to gore mechanics including new layers of tissue and dynamic bone destruction from bullets. New sounds were also made to accompany the new effects. See Also Arrow Cam. Booby Trap: Along with the trip mines, regular mines, and explosives the player can now also deliberately lure enemies with distractions into booby traps. Boom, Headshot! : Now with a more detailed gore mechanic including dynamic bone destruction. New sound effects were generated for the game to add to the visceral effect. The head shot is again the sweet shot of the sniper adding more xp for head shot kills. It is also a guaranteed kill shot every time. When making a kill shot at a certain distance and/or difficulty you will get bullet Arrow Cam effect. There is a focus mode where if the character's heartbeat is low enough it will slow time down making it easier to target fast enemies and take more difficult shots. Cold Sniper: Karl Fairburne, as always, is extremely unemotional and cold-blooded, almost behaving like a robot. Except for when his friend Brauer gets blown up by a Tiger tank, which is the only time in the entire series he displays emotion. Likewise, the German snipers you encounter throughout the game do not emote or say anything. Damn You, Muscle Memory! : On consoles, you equip and unequip the binoculars by clicking the right thumb stick, and stand or crouch by pressing Circle/B. On consoles, you also use Circle/B to quit or go back in menus and suchlike. If you try to "quit" the binoculars by pressing pressing Circle/B, this can lead to standing up at inopportune moments. Desert Warfare: The entire campaign takes place in North Africa, one of the most famous recent examples of this trope. Difficult, but Awesome: The Welrod is your first pistol, and is a silenced pistol with a One-Hit Kill ability. Awesome! However, it's rather weak, so that one hit has to be a headshot, and it has a low firing rate, so you have to get the shot right first time. This isn't too hard if the target is obligingly standing still, but becomes rather more challenging if he starts moving around. Even Evil Has Standards: As the campaign progresses, several German and Italian soldiers and officers begin speaking out against Vahlen and his increasingly questionable actions, with some even betraying him and intending on reporting him to Field Marshall Rommel. Exploding Barrels: Explosive barrels, fuel cans, and scattered explosive munitions for various forms of artillery. The obvious clue is they are red or have a red part. There are also large exploding fuel drums that can be found in various depots. They can also be set off by setting a distraction fire by the red barrels or munition piles. General Ripper: General Franz Vahlen is really intent on defeating the allies with his top secret weapons project. So much so, he cuts corners, rushes production by any means, and even executes his own men when they even slightly slack off. Groin shots are a lethal hit and legitimate shot for killing enemy troops. If you use focus mode the game will give you a slo-mo of the carnage. Yes you can shoot Hitler in the nuts and if he has two, it's a body double. Hand Guns: Handguns are present in the game again with the player at least being able to select the Welrod silenced pistol and additional side arms as they progress. Harder Than Hard: Difficulty levels are Cadet, Marksman, Sniper Elite and Authentic. Authentic has the description "Only sniping purists and masochists are welcome. No saving allowed." Hollywood Silencer: The Welrod is again a small chuff rather then the door slam it has in reality. DLC gives you a suppressed semi-automatic, the HDM, which for some reason is as silent as the Welrod, despite being semi-automatic and therefore having a noisy cycle. Immune to Bullets: Not as drastic as the last game. The vehicles have an array of weak points that can be now targeted that can possibly destroy the vehicles. Hits in other places will do next to nothing. Lead the Target: Due to the shooting mechanics targets on the move need a lead based on range and speed of the target. These can be the most difficult shots to pull off. Leaning on the Fourth Wall: If you kill Hitler in the "Hunt The Grey Wolf" DLC and reload your save (presumbably to get the other Hitler-related trophies in one play through), Karl will remark something like "this feels like deja vu". Malevolent Masked Men: The main opponent of the "Save Churchill" DLC is an enemy sniper who wears a metal mask and who leads a sniper team that also wear masks. Moe Greene Special: Eyes can be deliberately targeted with a gory display of the eye being mangled and popped by the bullet. Mooks: The various Nazi troops that are part of the Afrika Corps. The generic troops are little more then sniper fodder with more elite troops providing more of a challenge. The DLCs introduce a specialist Wermacht formation responsible for field-testing new weapons and killing Allied officers, and these soldiers are probably the toughest mooks in the series so far. They're not immune to bullets, but they carry all manner of explosives and use shoulder-mount rockets to flush you out. More Dakka: Enemy troops and the player both have access to automatic weapons and the benefits of automatic fire they bring. Various vehicles have machineguns as part of their armaments and will turn them on the player. No Scope: The player can shoot enemies with the sniper rifle without use of the scope. While not as accurate it can be handy in a pinch. No Swastikas: We see a variety of red-black-and-white flags and banners which suggest the Nazi flag without actually being it. Not So Different: A rare example which isn't built upon in the game. Vahlen, the Wunderwaffe engineer, revels in war, and accuses Karl of the same attitude. Karl responds that he and Vahlen are not the same, and when he is about to kill Vahlen, Karl with disgust remarks that he is nothing like him. Karl Fairburne: I'm not like you. I remember who I kill. One Hit Poly Kill: Depending on conditions the player can kill multiple enemies with one bullet. Either one bullet passing through multiple enemies or causing certain objects to detonate killing groups of enemies. Only Known by Their Nickname: Enemy soldiers exclusively refer to Karl as "The Desert Ghost". Pink Mist: Rendered with increased detail as bone fragments and blood often spray out of an enemy. Prequel: This game takes place three years before the events of Sniper Elite V2, and shows Karl Fairburne's tour-of-duty in North Africa under the British SOE. Regenerating Health: Present, but unlike V2, this game uses the "segmented regeneration" variant. To regain all of your health, you must use a medkit or bandages. Save Scumming: Encouraged by the game: "Save frequently" is one of the gameplay hints that appear on loading screens. Sniper Duel: Surprisingly only one official one, and it is in the "Save Churchill" DLC no less. Granted, any encounter with a sniper can turn into one. Sniper Scope Sway: Player heart rate, position, and whether you are using the focus mode or not can cause a player's scope to sway. Use of focus mode temporarily eliminates or greatly reduces the effect, and resting the rifle on a surface can also reduce it. Different rifles also have different amounts of scope wobble, and modifications to the rifle can either improve it or make it worse. All but one of the guns in the game actually exists, though at least one of them was never seen in the Sahara Desert during the war (or possibly ever). The secret German superweapon actually did have plans drawn for it, though it was never manufactured due to the obscene costs. Sniping Mission: Every mission is a sniping mission. The player is a sniper under taking special covert missions and your primary weapon is a sniper rifle. While the player has access to other weapons and means of eliminating enemies the game is built around the use of the sniper rifles. Status Buff: Enemy officers make regular enemies more observant. Stuff Blowing Up: An increase in environmental items that can be shot and explode creating explosions and fire balls everywhere. Vehicles have nice explosions and even spare ammo boxes can be set off. Stupid Jetpack Hitler: Fairburne uncovers and eventually stops an attempt to produce a prototype super-heavy tank called the Landkreuzer P.1000 Ratte, armed with naval artillery guns and having 9 inches of armor plating. Tactical Withdrawal: There is a new relocation system that encourages a player to move before the enemy finds them. Multiple shots from a location will lead the enemy to the player more quickly or increase the chances of an enemy finding the player when they do move. Take Cover! : While there is no dedicated cover button like V2, the player can still crouch behind objects and pop out to shoot. Among the German Panzers that Fairburne comes up against are the Panzer III, the Panzer IV, and The Dreaded Tiger I. Project Seuche turns out to be the creation and deployment of a super-heavy tank called the Landkreuzer P.1000 Ratte, a monstrosity far bigger than the already massive Tiger. The Guards Must Be Crazy: After detecting a sniper in the area more than a few times the guards will still stop looking and going back to a more relaxed state even if several of their comrades have been shot in succession. Third Is 3D: The game can be played in stereoscopic 3D if you have a compatible TV with PS4 versions. Urban Warfare: Some of the environments can take part in small villages or bases providing both challenges and opportunities to the player as they traverse the terrain. Villainous Breakdown: In several of the late-game diary entries found by Fairburne, Vahlen begins going through a long and drawn-out one following Rommel's defeat at El Alamein, hoping to rush his project to completion for as long as the Afrika Korps can hold Tunisia and he's still in Hitler's favor.